This article was originally published on defeatdd.org. There’s a story that haunts me in child health. It’s the story of the child who successfully fights an episode of malaria one year because she got the right medicine at the right time but the following year, after a severe episode of pneumonia, she dies because she never received antibiotics. Or the story of a baby born HIV-free because her mother took the right medicine at the right time only to grow up to become so malnourished that after several bouts of diarrhea and with no access to oral rehydration salts or zinc she dies at the age of two. What is so alarming about these stories is how common they are and how they are directly related to the way the financing of global health is structured. It’s not that we don’t have clear goals in child survival. Millennium Development Goal 4 set a very specific target – to reduce the child mortality rate by two-thirds from the 1990 level by December 31st 2015. What we are lacking are institutional structures at the global level that are focused on financing child survival and that are accountable for achieving MDG4. Instead we have institutions that are either focused on financing and delivering a specific child survival intervention (e.g. vaccines) or on financing the prevention, diagnosis and treatment of a specific disease (e.g. AIDS, malaria, tuberculosis or polio). These organizations are primarily accountable for increasing vaccine coverage, or bed net ownership, or the distribution of rapid diagnostic tests but not for the number of children’s lives saved, or for their impact on the rate of reduction in child mortality or for their relative contribution to MDG4 achievement. There’s no question that this degree of focus has delivered results in specific areas. AIDS, malaria and measles deaths among children have fallen dramatically and now represent 7, 2 and 1 percent of all under child deaths respectively. Polio is almost eliminated. In contrast the areas that have not had a well-financed institution driving progress, including newborn health and pneumonia and diarrhea now account for 65 percent of all under 5 deaths and malnutrition is an underlying cause of more than 50 percent of child deaths. At the end of the day the bigger question remains: how much have we really achieved if we provide the bed net that protects one child from malaria one year, only to leave that child malnourished and totally exposed to death from pneumonia or diarrhea the next year? With about 800 days to the MDG deadline, there are welcome signs that the major institutions that finance child survival are committed to achieving the unprecedented levels of collaboration that are required to fund the gaps in child survival and accelerate achievement of MDG4. The World Bank, the Global Fund, GAVI, UNICEF and the UN Commission on Life-Saving Commodities for Women and Children and their leading donors have the capacity to both finance and deliver more integrated packages of interventions that target the leading causes of child death and “fully protect” children against the leading threats to their survival and there are positive signs that they are moving in this direction. During UN General Assembly week the leading stakeholders in child survival met to discuss ways to support the efforts of ten countries to ensure that children with diarrhea and pneumonia are actually treated with oral rehydration salts, zinc and antibiotics. 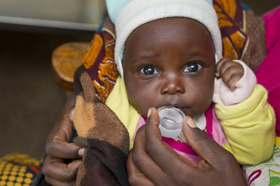 One million child deaths could be prevented by 2015 if these ten countries achieved this goal. There was a genuine willingness to find ways to reduce diarrhea and pneumonia deaths by better aligning the delivery of vaccines and the prevention, diagnosis and treatment of pneumonia, diarrhea and malaria. There was recognition that not only could greater integration deliver better health outcomes for children, but that the efficiency savings from more coordinated delivery of interventions could be significant. We need to turn this good will into action quickly because many children’s lives depend on the global health architecture getting this right. As the President of the World Bank, Jim Kim, has said, it is patients who pay the ultimate price for the current fragmented approach to health delivery. What we need to be aiming for, and what MDG4 achievement actually requires, is integrated, effective health delivery systems that provide value for children. Financing and delivering these integrated packages of interventions for newborn care, pneumonia, diarrhea, malaria and nutrition and targeting them to the greatest concentrations of vulnerable children is now the central challenge of the child survival community in the countdown to 2015. We are in the midst of the greatest child survival revolution the world has ever known. In our lifetimes, we have witnessed countries like Ethiopia, Bangladesh, Malawi, Egypt and several more reduce their child mortality rates by 70 percent. But despite this progress, the MDG4 achievement gap remains wide. As UNICEF has told us in the A Promise Renewed Progress Report, the deaths of 3.5 million children must be prevented to achieve MDG4. The current global health architecture can be made to work for MDG4 but it will require leaders to align around one primary mission – child survival; to hold themselves accountable to one fundamental measurement – children’s deaths prevented; and to find creative ways to finance the major gaps in child survival within the framework of the financing structures that we currently have. Because at the end of the day, we all work for children and we have to make the global health architecture work for child survival and MDG4 achievement.